It’s officially the season of parties, pixies, pies and presents. Yay! Of course, it’s also a time for giving, which means it’s a great excuse for making gifts. The Faberdashery elves have been busy creating some super seasonal inspiration. The result is our 25 Days of Making project. We’ve created a collection of unique and stunning designs especially for the countdown to Christmas. 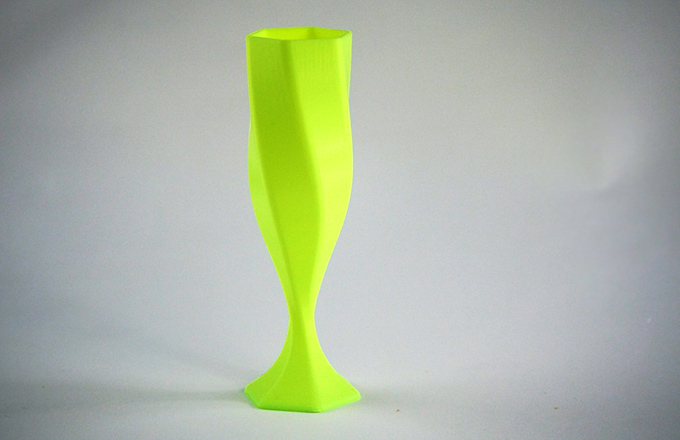 For the next 25 days we’re releasing a gorgeous, new design simultaneously on Thingiverse and YouMagine. All of the collection prints beautifully in those special seasonal colours, but of course we’d love to see your own remixes. Every piece in the collection has been designed to print in under an hour and should fit on even the smallest build plates! We hope that you will join us in in the seasonal printing fun and can’t wait to see your makes! So pile up the mince pies, bring out the Bing Crosby, chuck some chestnuts on the fire and let 25 Days of Making begin! Here’s a great project that caught our eye recently. 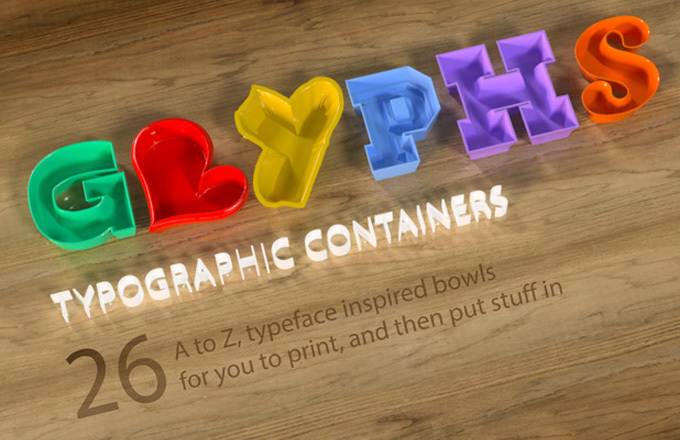 Tony Short’s collection of ‘glyph’ containers is an eclectic collection of 3D printable letters. It really is a labour of love and captures the special relationship developing between the worlds of typography and 3D printing. Tony was kind enough to write some words for us about his fantastic project. ‘My background is in Typography. It’s what I studied at university, and the things I learnt there continue to affect my designs to this day. Normally I work with print or web based design, but after buying a 3D printer a year ago (Ultimaker 2) I started exploring how I could fuse my typographic interests with 3D design. Unsurprisingly I have a HUGE typeface collection, most of which I never get to use day-to-day, being far too decorative, or plain weird! 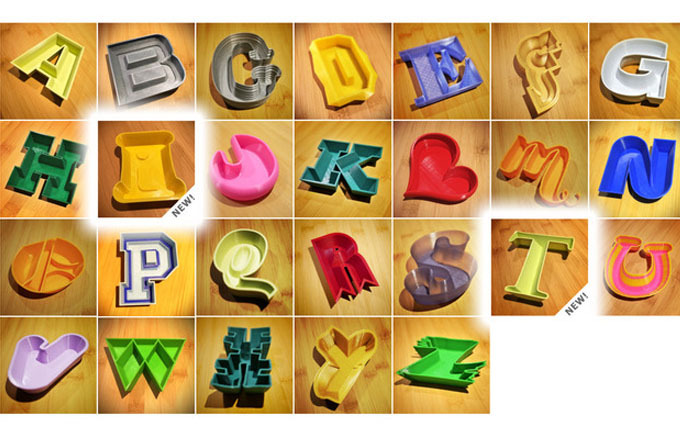 I also felt that a lot of typographic-based designs on Thingiverse were using very basic (OK, dull) typefaces. I wanted to inject some variety, highlight some of the great typefaces, and celebrate some unsung typeface designers. I’d already done some typographic models in the form of boxes, so I thought containers may be both fun and useful. Hence the typographic glyph collection came into being. I designed all of them in Moments of Inspiration (MOI3D) with some processing in Meshmixer to help hollow out some of the more complex forms. This collection helped a great deal with my 3D design and printing skills, which improved a lot over the 3 month period I was working on the project. The final renders were done in Fusion360, which I’m dabbling in, but the learning curve is steep! All of Tony’s Glyphs are available on Thingiverse and we can confirm look A-Mazing! Tony plans to do a collection of carved letterforms next, which would allow people to create their own composite monograms, or add to, or carve into their 3D models. He also has an exciting Christmas project in the pipeline. So watch this space! It has come to our attention that one of our Halloween makes may be a little bit scary. Our ‘BOO’ sign was designed to show the potential 3D printing has to be a little bit scary. We do apologise to anyone who has printed this design not knowing it would result in them being a little bit scared. Faberdashery would like to assure the public that ‘BOO’ is safe to print and has been done so already by some very brave members of the public. If you are of a nervous disposition make sure you have somebody with you at all times during the print in case you get a little bit scared. Although the design is written in upper case letters, there is nobody actually shouting ‘BOO’ at you. You can print this design in Glowbug Yellow, but be aware that it will glow in the dark which will make it a little bit more scary. If a glowing ‘BOO’ is too scary, you may want to print it in Classic Black or Smoky Black, ensuring it is only visible during the day and can’t scare you at night. If a Classic Black ‘BOO’ is too scary, consider printing it in a pastel coloured filament which will make it a bit less scary. If others worry that the print itself is inherently evil, remind them that it is made from PLA which is actually a nice plastic. ‘BOO’ can be placed beside of a nest of spiders, but that’s really creepy, so, you know, maybe don’t do that. For some people this print will be simply too scary. If so, we would recommend printing one of these designs instead in some nice rainbow colours. If you have printed ‘BOO’ and are worried that it is a little bit too scary, please get in touch. October’s here, the nights are drawing in, spiders are attempting to take over your house and is there a face on that tree stump? It can only mean one thing – it’s nearly Halloween! Yes, it’s the season for scaring; so time to hit your 3D printers and turn out some serious spookiness. At Faberdashery we love any chance to scare ourselves silly. So in celebration of the most terrifying time of the year, we have put together our definitive guide to 3D printing for Halloween. Here’s our top ten Halloween 3D prints. 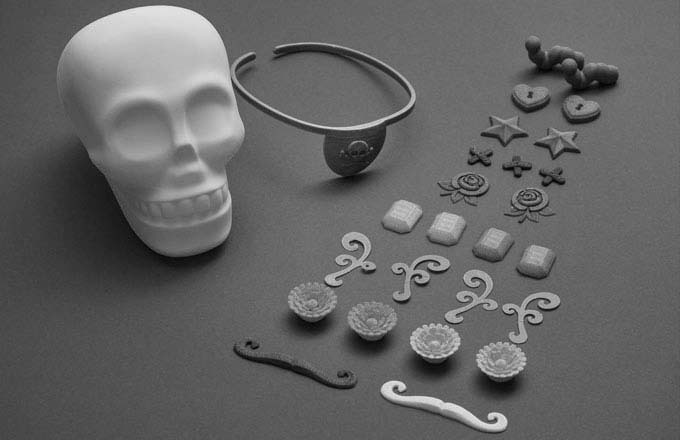 These prints come from our ‘Skull Playset’ which you can find on Thingiverse and Youmagine. They make great halloween decor as well as spooky serving bowls. Add to the terror and print them in Glowbug Yellow. Or go big, like we did, and print a terrifying giant skull! Murder of crows anyone? Yes, of course! Find the 3d file here. This apple design has to be the perfect use for Classic Black this Halloween. It’s also a great way to dish out halloween treats. Put a few sour sweets in the mix and wait for your victim to take a bite! Mwahahahaha…..
Don’t get stuck with hollowing and carving shenanigans. 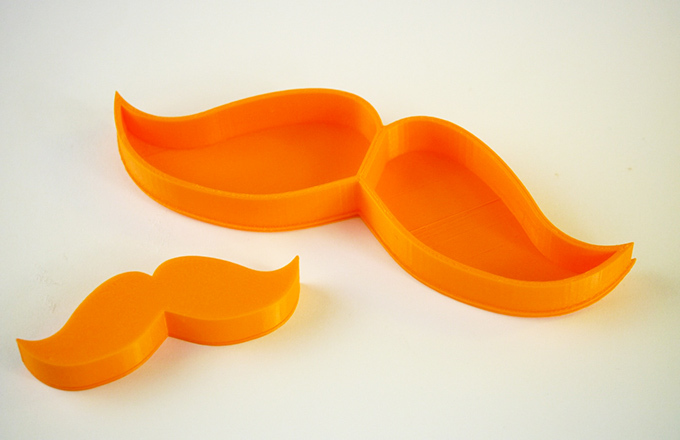 Put your 3d printer to work and print out these fantastic pumpkin prints in translucent Orange Fizz! Originally designed to sit atop your drinks bottle, this 3d printed troll by David Hagemann works perfectly as a glowing halloween goblin. He does have printable eyes but we found that these candy eyeballs were just a bit more menacing. 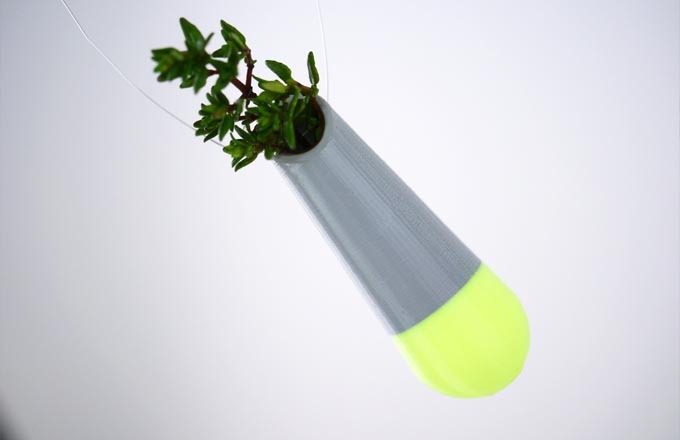 We’ve called these Glo-bobs as they are designed to thread onto glow stick bands. They make great alternatives to halloween sweet treats and keep little monsters visible in the dark. Bats are a halloween staple. These designs are quick and easy. 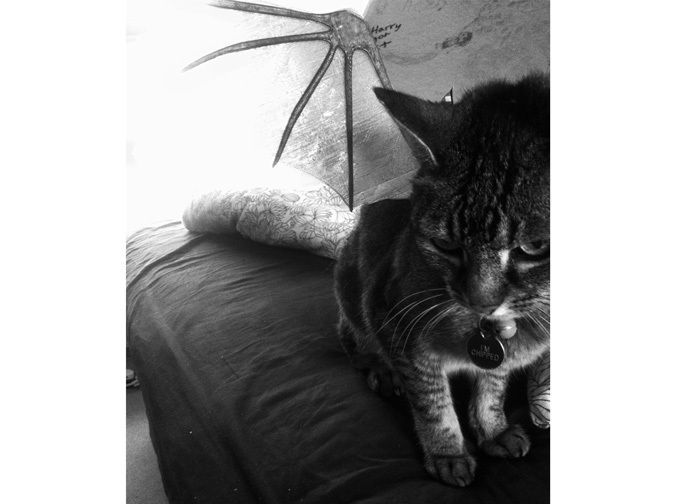 Print them in Classic Black and Smoky Black and hang them up or stick them on your walls for some spooktacular decor. Find the designs on Thingiverse and Youmagine. These spiders by Scott Lahteine are creepily realistic and perfect for Halloween mischief. 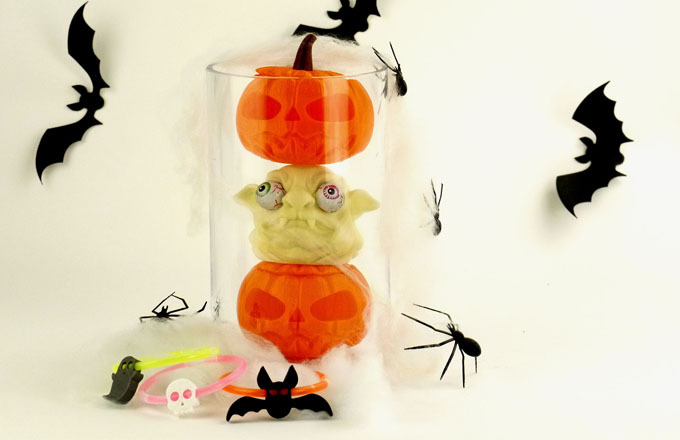 Place them amongst your Halloween decor, put them on your Halloween treats, nestle them in your Halloween hair or launch them at your Halloween victims…. That tree is definitely looking at you funny! We shrunk down this Tree Stump Pencil Holder by Casey, and printed it in Smoky Black to create the perfect Halloween candlestick. Get the message across with this ‘boo’ sign. Download on Thingiverse and Youmagine. We printed our one in Earl Grey and Glowbug. 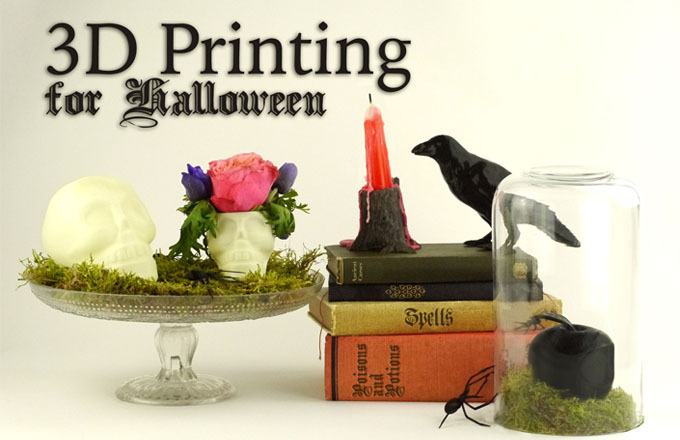 We hope you have enjoyed our Halloween 3D print guide. We’ll be posting our Halloween prints on Twitter, Facebook and Google + in the run up to Halloween. We’re really looking forward to seeing your Halloween makes so be sure to tag them with Faberdashery. We are offering free shipping for all UK orders over £100 and International orders over £200. This offer will run from the 1st – 15th December. So order now and make sure you’ve got the hottest printing colours for the festive season! If you’re giving the gift of Making, check our Christmas Shipping Guide for delivery before the 25th. 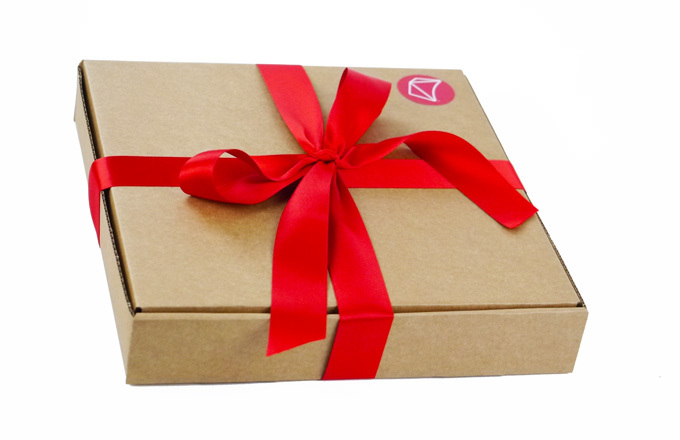 We’ve covered all shipping options, so you’ll be able to get Making in time for the holidays! We will be open for business throughout most of the Holiday Season. However, the Faberdashery elves will be taking a well-earned break on the following dates: December 25th & 26th, January 1st. 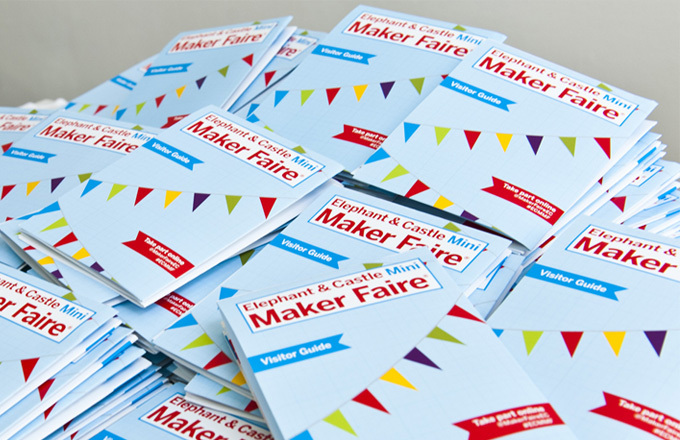 Faberdashery are excited to be exhibiting at London’s Mini Maker Faire. We’ll be joining a spectacular line-up of Makers, designers, artists, crafters, engineers, scientists and technologists from across the capital. 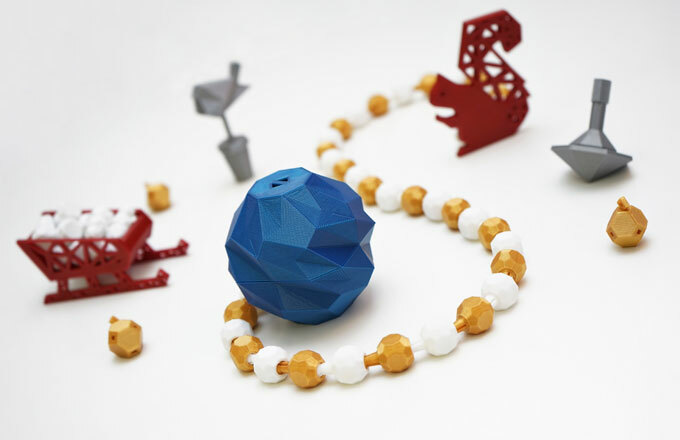 We’re getting seasonal with our stand; showing you how you can Make Merry with 3D printing. 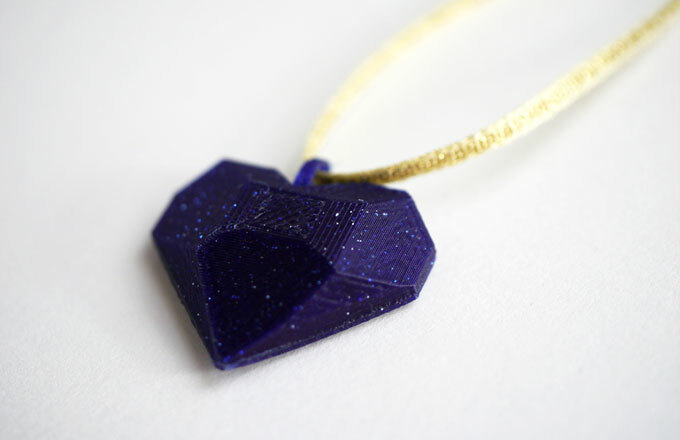 Our exhibit includes a spectacular array of 3D prints, designed by Faberdashery, especially for the festive season. Faberdashery are also providing sponsorship for other exhibitors at the Faire in the form of material for their print projects. Visitors to the show will also get the opportunity to win a pack of our filament when they race 3D printed robots at the Cannybots stand. We can’t wait to meet all you wonderful makers and show you the amazing things we have been doing with our materials. Be sure to come and say hi to the Faberdashery team and grab some of our fun give-aways. To see photos from the event, head over to our Facebook page. *Pun alert – we’ve inserted as many halloween puns as is humanly (or un-humanly) possible into this post. If you have a fear of puns please stop reading now! Wicked Pumpkins Demons are a ghoul’s best friend but pumpkins are even better. 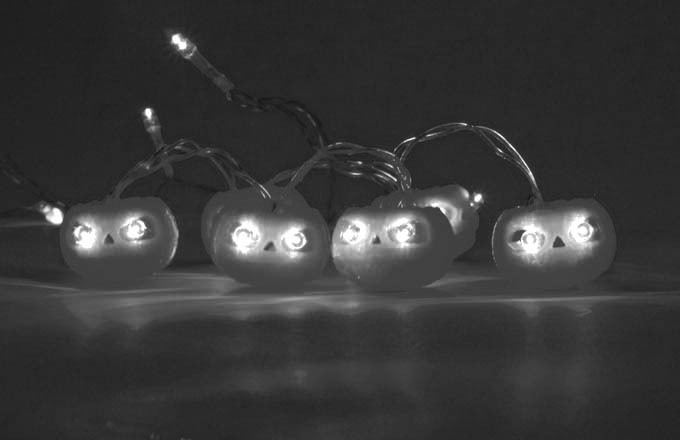 Print out Makies fantastic Jack-O-Lantern and insert a string of lights to create these glowing pumpkins. How evil do they look! Glowing Eyes Ever felt like you’re being watched? These glowing eyes will ensure you alway are. 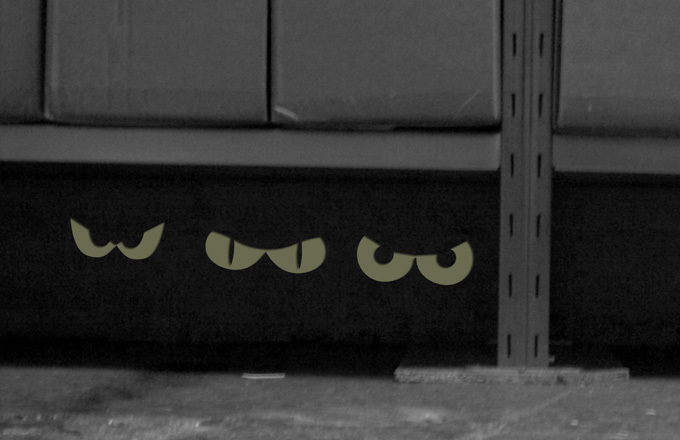 Print out them out in Glowbug Yellow, place them in a dark corner and enjoy their malevolent stare. Halloween Cookie Cutters A great activity to do with the kids. 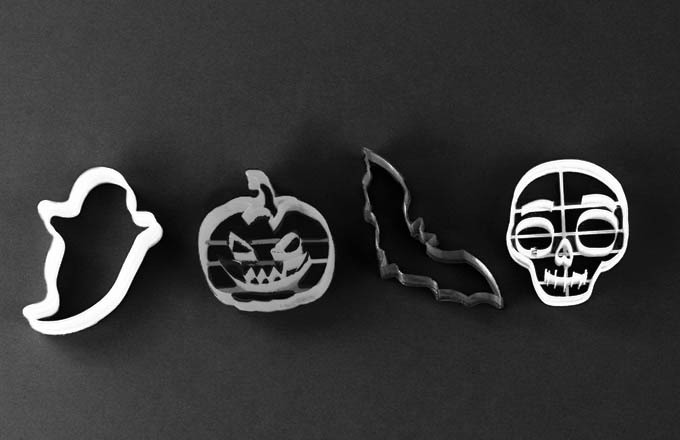 We have created four halloween themed cookie cutters – skull, pumpkin, ghost and bat. Print them out and have fun making cookies to die for. Treat toppers Treats or tricks at the ready! Why not combine both? 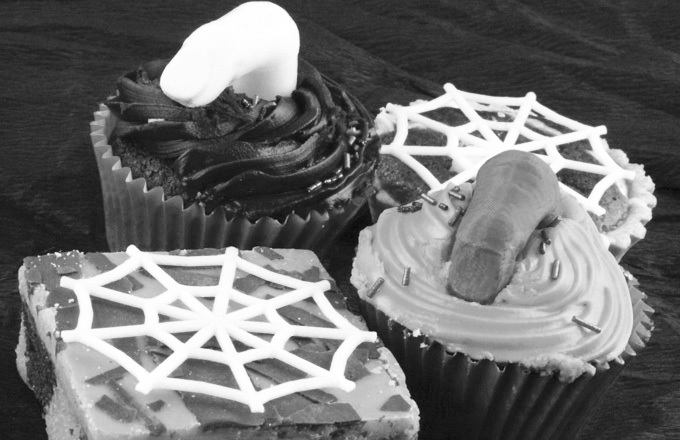 Print out zombie fingers and spiderwebs to give your cakes that extra eeeek factor! Pet Bat Wings It’s only right that your pets should get in on the Halloween fun. These bat wings make the perfect costume. Just make sure you’ve installed a bat flap! Skelly Make no bones about it Halloween would not be the same without a creepy skull on show. We created Skelly, the dress-up skull, to bring a bit of variety to your Halloween makes. He comes with 10 different accessories that are sure to tickle your funny bone. But don’t stop there! Why not scale him down and print out a collection of skull beads to wear in true headhunter style. From all the Faberdashery team we wish you a very fun, scary and creepy Halloween. Mwaaa hahahaha…..!!! 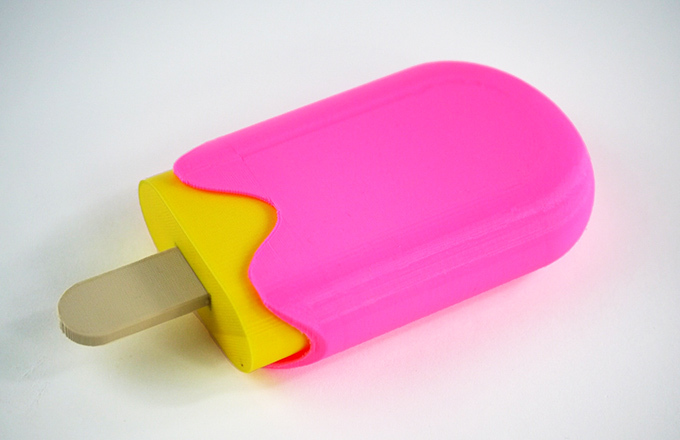 What will you be printing this Summer? It’s July and the summer is officially here. Now is the perfect time to show off your makes in the sun. Here’s our round-up of the best prints to help you make the most of summer. Make your picnics memorable with fun and colourful prints. How about this smart Snack ‘Stache. 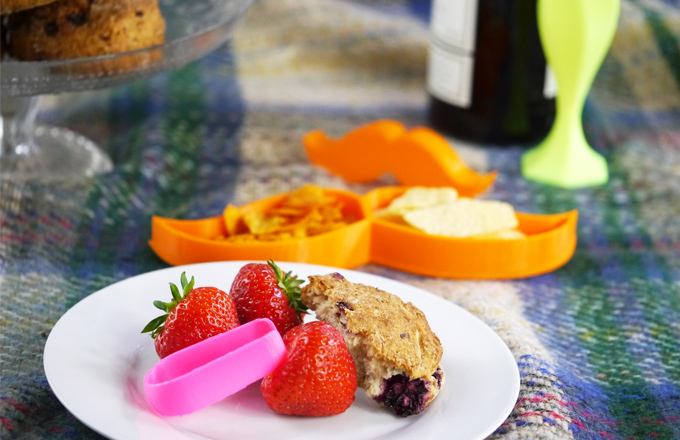 It is divided in two to keep your snacks separate and comes with a slide on lid to keep them fresh in your picnic hamper. Talking of keeping things fresh, why not print off a handy bag clip to reseal snack bags when you’re out and about. For an extra special picnic this Hexagonal Champagne Glass by Linxer is the perfect print. We made one in Cyber Yellow to add some technopop to our picnic. For the classic Wimbledon-style strawberry snack you’ll find this simple strawberry huller by Daniel Noree is handy. 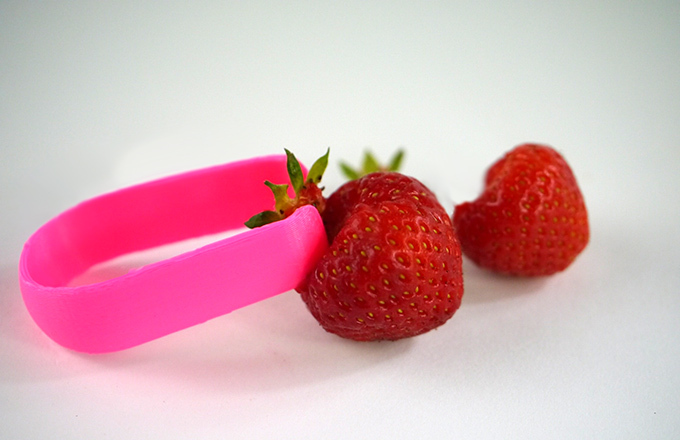 It’s small, quick to print and makes de-stalking strawberries easier than ever. If you’re taking your pooch out with you on your picnic, be sure to print this Dog Bowl Water Bottle Carrier by Chad Ruble to keep your best buddy hydrated. Of course you may just want to get out for a bike ride in the sun. 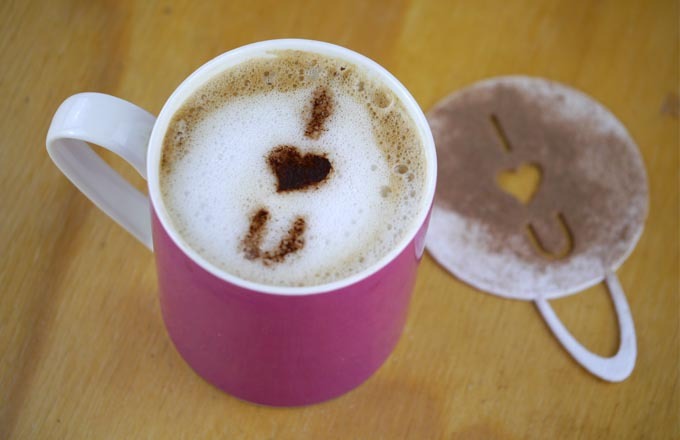 You can still enjoy a nice coffee though by printing out a handy Bicycle Coffee Cup Holder by James le Febvre. Simply print in a cool colour, attach to your cycle, insert coffee cup and off you go with your caffeine-loaded bike! Summer just would not be the same without a bit of festival action. 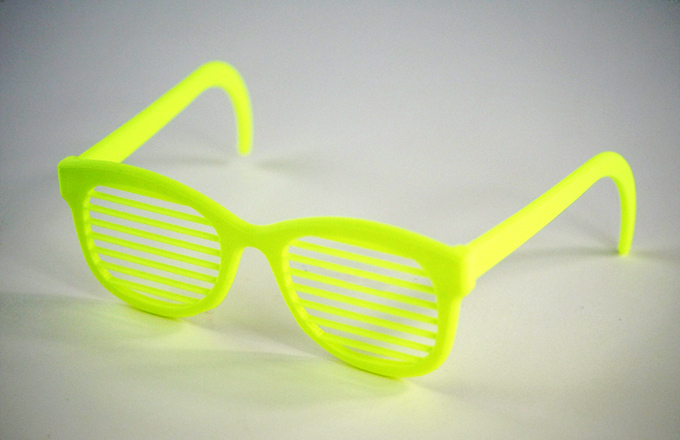 These shutter shades by Umake are essential printing for some serious partying. 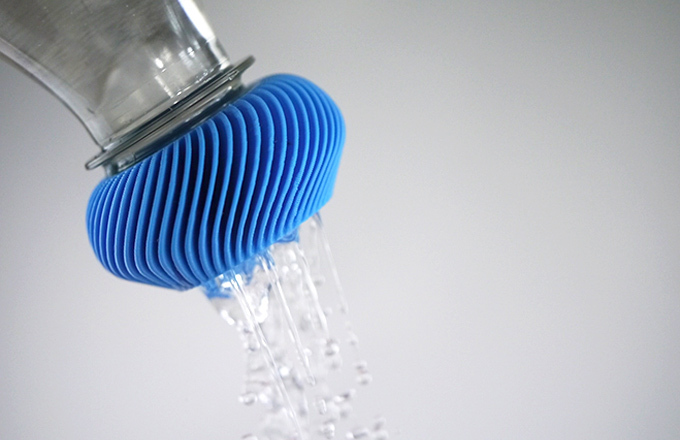 After dancing all night you’ll be glad of prints that turn your plastic drinks bottles into portable showers. This small one by Hiroaki Nishimura connects to your average 500ml bottle. If you want one that connects to a 1litre bottle you can find a print by Mark Edmondson here (yes, we know it’s meant for watering plants but why not use it to water yourself?)! 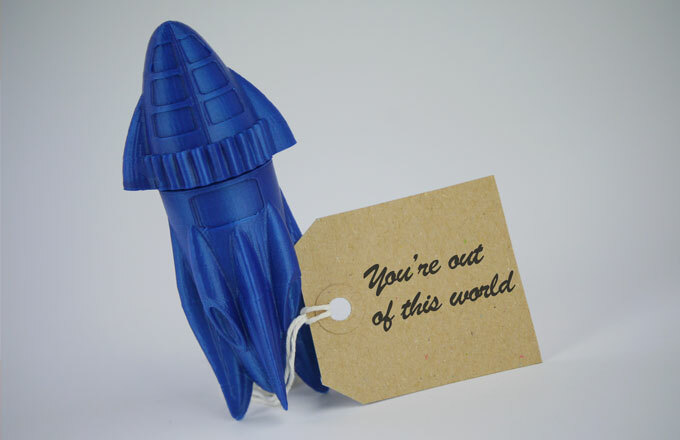 Finally, for making a bit of noise, you should print these fantastic maracas by Ultimaker. 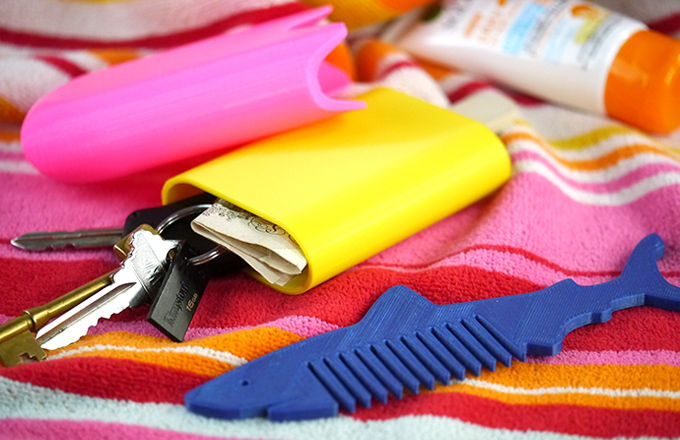 There are some great prints out there to make your beach trips extra fun. Why not start a large hollow Tardis by Max Beach. Use it to make sandcastles that strike fear into the hearts of Cybermen, Daleks and Sea Devils! You’ll need a shovel though, and you can find a great one for printing here. Going for a dip? 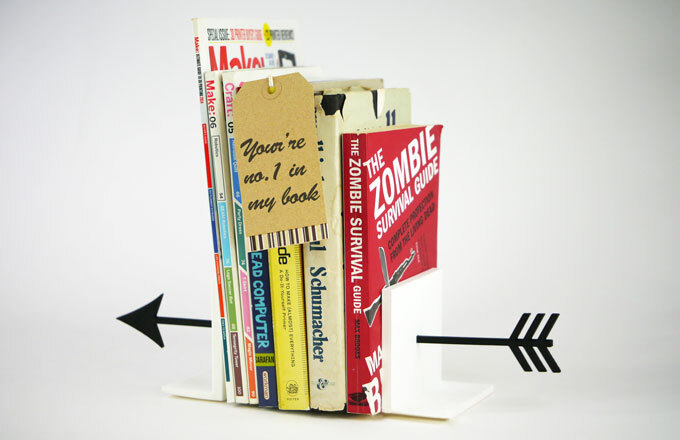 Make sure you have somewhere to stash your cash and keys.This Lolly Box is the perfect accessory for the job! 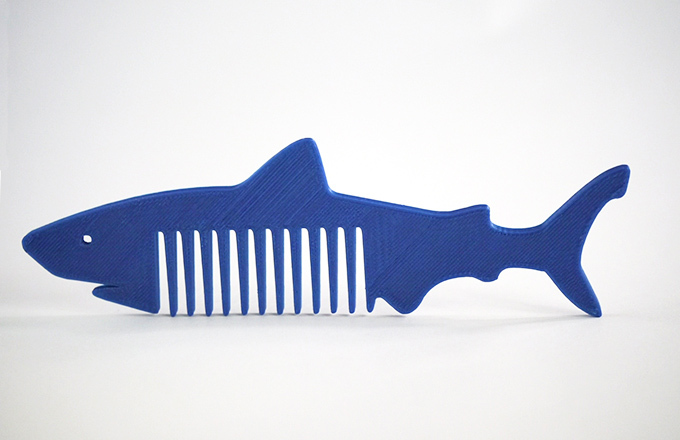 And when you’ve finished your swim, tame unruly tresses with this Shark Comb. These are just a few of our favourite summer makes. So what will you be printing this season?